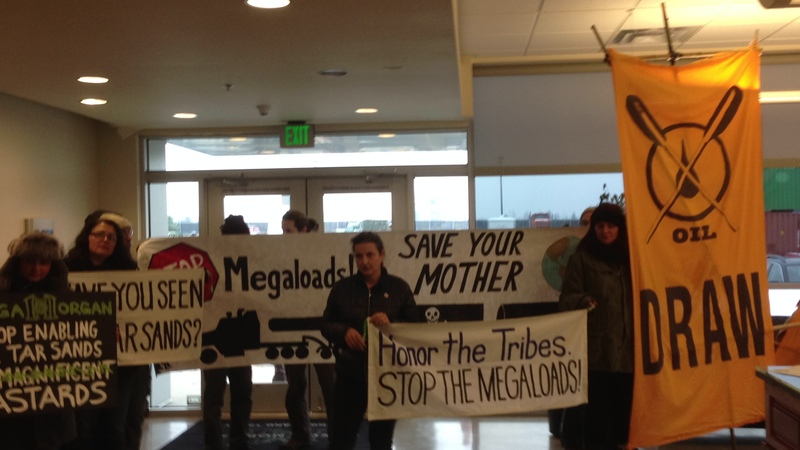 We have reports that the second megaload is stalled out in Pendleton, Oregon, due to weather, after Umatilla hereditary chiefs, drummers and tribal members gathered with allies for a ceremony. Nixyaawii Drummers, from the Confederated Umatilla Tribes, gathered in prayer and song with 70 friends for a ceremony called by Chief Carl Sampson, Yellowbird, of the Wiluulapam tribe (one of the four confederated Umatilla tribes). Chief Sampson spoke of the history of the treaty of 1855, and the ensuing war of settler encroachment. Another person from the Caddo tribe, of Texas, Louisiana, Arkansas, and Oklahoma, spoke about how TansCanada desecrated their sacred sites and created divisions in their tribe to make the Keystone XL pipeline. There was one brush up with police. The megaload is illegally slated to move through Umatilla Accustomed Sites for hunting, gathering, and fishing, on its way to the Alberta tar sands, where it will manufacture oil to be shipped through the KXL pipeline (and, potentially, the Pacific Northwest). 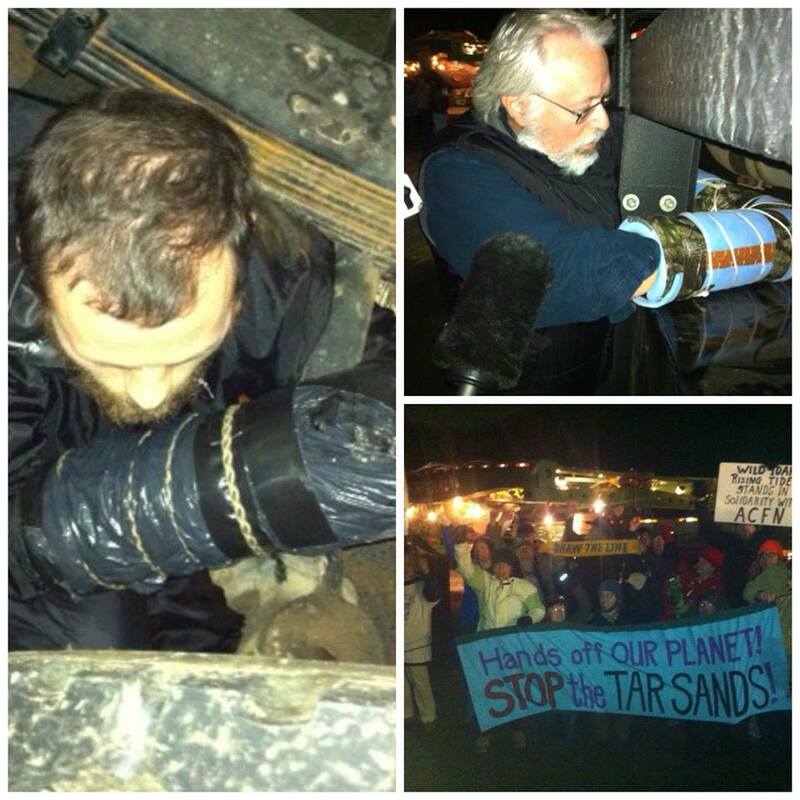 17 activists were arrested yesterday night, and 16 are currently in jail in Grants Pass, after a double-blockade of the Omega Morgan megaload heading through Eastern Oregon to the Alberta tar sands. The first blockade went up at around 7:30pm. The passenger seat of the car was removed, and there was a hole cut into the floor. Air was deflated from the tires. Once the car was in place on the road, one individual crawled underneath the car, and the other sat in the passenger seat area; these two individuals were locked together through the hole in an L-shaped lock box. When police arrived on scene, they smashed the glass of the car, then used the “jaws of life” to cut the car apart. They dragged the two individuals to an ambulance, still locked together in the L-shaped lock box. Police aggressively arrested 3 other individuals serving as the support team who were actively trying not to obstruct the load or police activity. Arrestees reported that the police were using pain compliance to remove the individuals from the car, and are experiencing minor injuries such as bruised wrists. The scene was cleared and the car towed by around 8:10pm. At around 8:30pm, another blockade was deployed on Hwy 26, 1-1 1/2 miles East of John Day. This blockade included a 6ft trailer in the middle of the road, tires deflated. On the trailer was a barrel of cement. One individual was locked to this barrel with their arm inside a lockbox and encased in cement. Another individual was locked to the axle of the trailer. At this blockade, in addition to the 2 people who were locked to the trailer, there were 9 additional arrests of individuals on the side of the road who were not trying to obstruct the load or police activity. Other individuals were unable to get close enough to find out how the police dismantled this blockade without also being threatened with arrest. Arrestees confirm reports of pain compliance techniques used in the dismantling of this blockade. According to bystanders, the police lifted and pulled the trailer, and the person locked to the axle was dragged on the ground. Another individual had her jacket sleeves cut off, which caused her to be exposed to the extreme cold while she was locked down. All photographers and videographers on the scene were arrested, so our promises of photos and videos may take a little while to get fulfilled. This morning, employees at the Omega Morgan corporation were surprised to find a boisterous crowd of climate justice activists in their Hillsboro office challenging their role in tar sands extraction. The activists burst into a meeting with chants and banners, causing the meeting to disperse. One protestor then read a letter to employees of Omega Morgan demanding that they stop moving mega loads and cut ties to tar sands extraction. 18 cop cars are parked outside of the office, and 11 cops have formed a line inside of the lobby to keep activists from leaving. A tense standoff is happening right now. Police are insisting that the activists leave or else be arrested, and one of the cops is delivering the letter to the CEO. More updates and photos to come. This is one of several actions in the last 2 weeks, including an office occupation in Fife, WA, by Seattle Rising Tide in solidarity with protestors who stopped the Omega Morgan mega load from rolling out of the Port of Umatilla by locking down to the 380 foot long behemoth. Mega-Slow Omega Load Still in OR, Take Action Now! As the longest and heaviest piece of tar sands equipment to date lies grounded in Oregon, waiting for the weather to improve , activists across the region are mobilizing and gearing up for its inevitable trek through Idaho and Montana. Other than being an extra-massive piece of equipment that requires extra-legal permitting, the story with this first of three pieces of equipment is the same. The forward march of the fossil fuel industry is seeking industrial corridors for their infrastructure — to expand and exploit massive reserves of oil sands in (so-called) Alberta. In the process of exploring, developing and opening up new infrastructure corridors they (shipping companies and oil corporations) threaten rural communities with a nightmarish industrial future. And this is just for equipment headed to commercial operations in Canada. What many in the struggle are not yet focussing on is U.S. tar sands development in Utah, which may contain up to 7 times the recoverable oil as Alberta. Imagine what the Northwest would look like if that comes to fruition. More notably these corridors (and their associated export terminals, pipelines, mining operations and disposal sites) threaten tribal territories and indigenous self determination. On the bright side, these projects have have ignited a powerful resistance to the entire fossil fuel agenda among red nations across turtle island (North America). There are no signs that the oil sands industry will slow down anytime soon. There is no question, however, that more people are aware of its destruction — with every new piece of equipment, every new oil spill, every front line testimony and every act of resistance to the cogs of the big oil machine. And more of those people are willing to take direct action to slow it down. Before there is a critical mass of resistance to physically shut down the tar sands, all we can do is slow them down, cost them money and malign their practitioners. For these Omega-Morgan loads there are several things you can do RIGHT NOW. While plans are in the works for a more direct response please consider taking the time to use these avenues to slow the loads movement. • MDT and ITD should not issue a permit to Omega-Morgan to transport the 900,000-pound load moving through Oregon. • Due to winter conditions and the load’s size, it is not likely to meet Montana’s 10-minute rule nor Idaho’s 15-minute rule — that is, not likely to meet each state’s mandated traffic delay limits for oversize load transport permits. 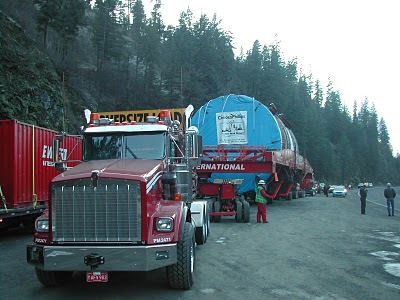 • Travel delays caused by this oversize load could prevent Montana and Idaho citizens from accessing critical emergency services. • MDT and ITD should conduct detailed environmental analysis and allow members of the public to comment before it even considers issuing a permit to Omega Morgan. 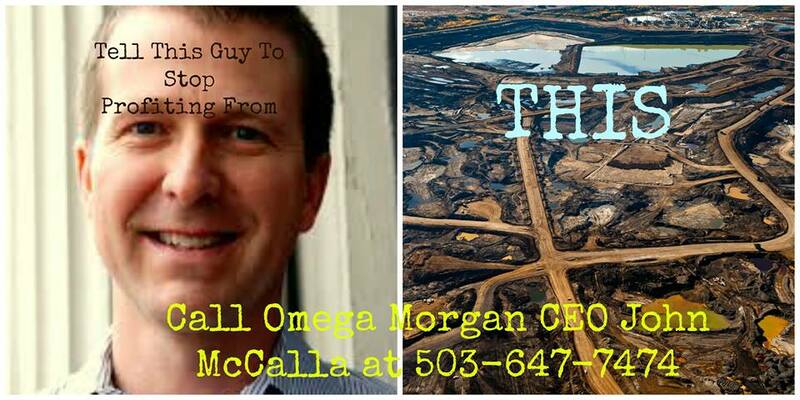 2) Call Omega Morgan CEO John McCalla at 503-647-7474 right now with a message: I oppose the tar sands and I want you to stop shipping equipment to process it. Here’s the link. Stay tuned to this blog, our listserv and FB pages for notices about any rallies and actions associated with these shipments in the coming weeks. Two activists who locked down to the megaload leaving from the Port of Umatilla, Oregon, this evening have been arrested, but not before an announcement from Oregon Department of Transportation that the megaloads will not be moved for another night! ODOT showed concern that the megaload would not make it to Pendelton by 6 AM, as their permit required. The truck is off and most of the workers have left. No police are in sight, and a contingent of activists will remain to ensure that the megaload does not try to move. On its way to the tar sands in Alberta, Canada, the 900,000 lbs megaload is slated to move through sensitive ecosystems and decaying infrastructure throughout Eastern Oregon and Idaho. Involved in the protest were Rising Tide chapters, 350.org, and members of the Umatilla and Warm Springs tribes. To help support the blockade and get the blockaders out of jail, please donate to the support fund at portlandrisingtide.org/donate. Also, please call (541) 966-3632, and insist that they release the arrested activists immediately.